January 22, 2015 | by Darcy Blake | Rock Steady Boxing SF is thrilled to be involved in Moving Day®, a fundraising walk event organized by the National Parkinson Foundation in San Francisco at Justin Herman Plaza on April 19 and San Jose at Arena Green East on April 25. At Moving Day, Rock Steady Boxing SF will be giving boxing demos and mini-classes teaching the proper boxing stance, jabs, crosses, and hooks. It’s a way to get moving to help improve daily symptoms of Parkinson’s and gain better balance, strength and confidence to fight back against Parkinson’s! Rock Steady Boxing SF started in early 2014 at Polk St. Boxing Gym in San Francisco. After several years of being a Boxing Trainer, Medical Social Worker, and Personal Trainer, Coach Kim Woolley took her interest from maintaining good mental and physical health to “neuroplasticity and boxing.” In 2006 in Indianapolis, Rock Steady Boxing was described as a non-contact boxing program for people with Parkinson’s disease. After further research, Kim found that forced, vigorous exercise seemed to be changing the daily lives of people living with Parkinson’s disease. She approached the owner of Polk St. Gym, Simon Redmond, who immediately came on board, and brought Rock Steady Boxing to the Bay area. 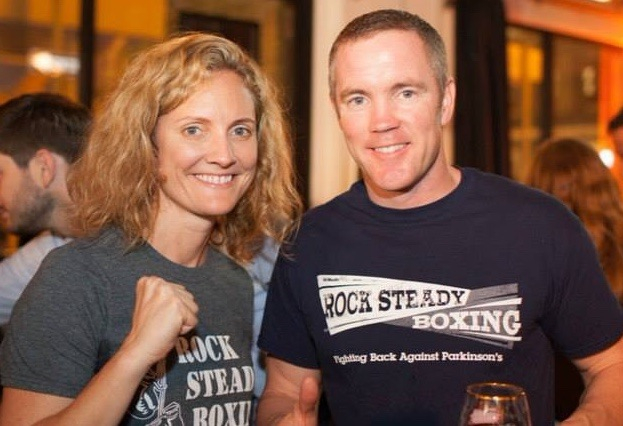 Kim and Simon became certified Rock Steady Boxing coaches in 2014, and classes soon began. Rock Steady Boxing SF offers classes 4 times per week for men and women of all ages and levels of Parkinson’s symptoms. The current students are between 39-76 years old, but fighters as young as 92 years old have participated in the program. Carpoolers from the East Bay, North Bay and Peninsula have joined people from all over the Bay area who travel to San Francisco for classes. Rock Steady Boxing offers mixed level classes, meaning that attendees can be at any level of stamina and ability. Boxing can be done from a seated position as well as standing. Boxing includes coordination, gait, balance, and agility exercises and classes that often include hitting heavy bags, speed bags and the Coach’s mitts. It is non-contact, so no one gets hit; it is challenging both mentally and physically, and it’s fun! Besides getting in great shape fighters develop a tremendous camaraderie with each other.